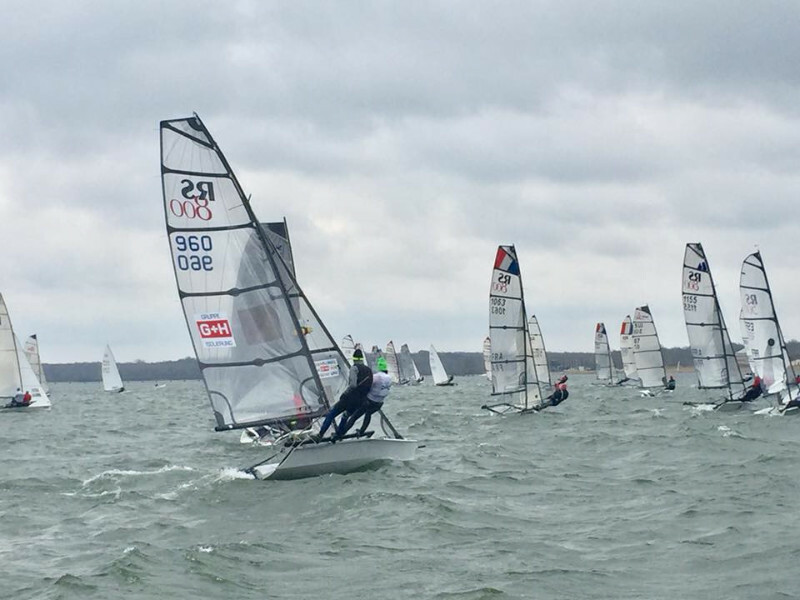 The Easter weekend saw the annual gathering of like-minded skiff sailors from all over Europe at the beautiful Lac du Der in the Champagne region of France. Organised by Breizh Skiff, the event combines a couple of days of on the water coaching followed by three days of racing. This was the first event of 2018 for the RS800 Eurocup series and well attended by 14 teams from 6 countries (the biggest class out of a total of 45 entries). As the only GBR team to make the trip we were made to feel very welcome on arrival by the French sailors, some of whom have been attending this event for 16 years. The venue was the sailing school on the southern shore of the lake with accommodation and meals provided in the neighbouring building just 100m away which made for a very easy and relaxed few days. The Breizh Skiff team had bought plentiful supplies of beer and wine with them as well as a great spirit of camaraderie between the many skiff classes represented. 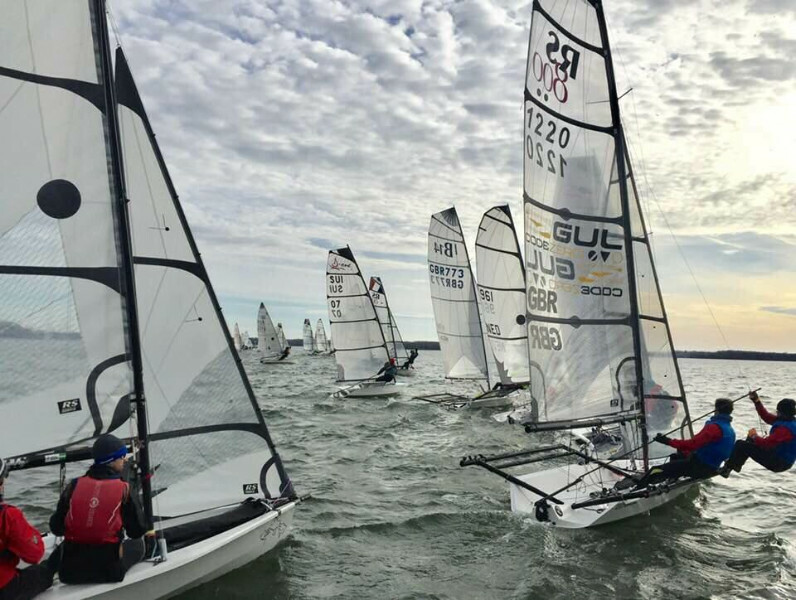 Most of the RS800 teams took advantage of the coaching laid on and we joined them on the water for a short shake down sail on the Friday afternoon. This gave us a chance to develop a new strategy for boat balance in order to preserve Luke’s leg strength (still very weak following a knee operation in January) so we could maximise the number of races we would be able to compete in. We were learning from our mistake the previous weekend at the Rutland Spring Champs after which he was hardly able to walk for 4 days! A sociable dinner followed that evening giving us a chance to get to know more of the other sailors and practice our finest Franglais. Saturday dawned bright, warm and sunny with very light breeze. No racing was scheduled until 2.30pm so it was a leisurely start while other crews arrived and rigged, plenty of time to walk to the local boulangerie-epicerie to acquire the essential croissants and baguette. The fleet launched to a fickle westerly breeze but after a bit of waiting around we got two good windward-leeward races in. The B14 of the experienced Cadre brothers (Alain & Francois) showed its form winning both races in the light breeze. We were the leading RS800 in both races with Laurent Thouvenin and Olivia Coindreau sailing consistently well to take a second and a third. Closely followed by Mateo Lavauzelle (last year’s European Championship runner up crew, now helming) sailing with young Quentin Milleret; who bagged a fourth and a second. In complete contrast to the T-shirt weather of the previous day, Easter Sunday arrived with bitter force 5 wind and only the occasional glimpse of sun. In what may have been a sailing championship first, certainly for us Brits, racing was delayed “for cold weather” (to get this in context it was not less than 5 degrees!) and so racing finally got underway at midday when the temperature was marginally improved. The first race was sailed in big breeze and gave the RS800s a chance to stretch their legs away from the other skiffs. The wind direction was similar to the previous day and the tactics of heading left up the beat to the shoreline generally paid again. We took the overall race win from the Cadre’s B14 followed by the RS800s of Jean-Louis Treguier & Camille Donnat Bart and Gilles Peeters & Heloise Baize who were both starting to find their pace. There was a fair amount of swimming going on further back in the fleet so there was some relief when everyone had finally finished that the wind kindly abated. The second race was tricky with boat-stopping chop left over from the earlier windy conditions. We managed to break clear to lead the RS800s round the course with Jean-Louis & Camille second again followed by Mateo & Quentin this time. Luckily Luke’s legs were holding out and as a lovely 12 knots had now settled in we decided to stay on the water for the next two races. Gilles and Heloise started to show their true form gaining a second place and then their first race win – leading off the favoured port end of the start line and holding their position for the whole race. We took another first and then second with Jean-Louis and Camille consolidating with a third and fourth place. Jeremie Brau and Ludovic Roblin took third place in the last race of the day as they began to get to grips with their hired RS800 – normally at the front of the 505 fleet, this was their first event in the boat before competing in May at the European Championships. When the results came in that evening, we were laying second overall to Alain & Francois in their B14 but with only a point’s separation there was all to play for on the last day. After another hearty three course dinner, the beer became free in order to finish the barrel. Then there was an impromptu bassoon recital by Camille and the surprise set up of a pop-up galley with a team of sailors cooking up tasty crêpes served with Gilles’ Belgian chocolate spread. Monday brought SSE winds of 12-15 knots and welcome sunshine. The schedule for the day was two windward-leeward races followed by a ‘Raid’ race taking us on tour around the lake including an island as one of the marks. The first race was short and sweet with us leading the RS800s chased by Gilles & Heloise and Mateo & Quentin. In the second race Gilles & Heloise led from the start to take the race win; we were a bit keen on the line and had to go back and then fight it out in the pack to get through to second. Jean-Louis & Camille suffered a capsize on one of the final gybes letting Mateo & Quentin through to a well-fought third. By this point we had no idea how we might be faring on handicap for the overall event but the B14 had been very close on each race. The fun race of the day but still counting towards the series results was the Raid which included a short beat to windward followed by a long run north up the lake. We led round the windward mark and then became separated from the rest of the fleet as we stayed left and everyone else gybed off. By the time we crossed track with the other boats we had narrow advantage over Jean-Louis & Camille and the B14 was looking good too. The breeze freshened for the beat back to the finish and Jean-Louis & Camille made gains with good speed and tactics while the B14 was close on their heels. We just hung on to the win by a couple of lengths from Jean-Louis & Camille while on handicap the B14 claimed second overall, just five seconds behind us. As we came off the water neither of us knew who would take the overall trophy. When the final results came in, after the nine races and two discards, we were tied on 12 points apiece with Alain & Francois but took the win on number of first places. Third spot on the overall podium and second RS800 went to Gilles & Heloise – looking good for Gilles’ European title hopes. Third RS800 was Jean-Louis & Camille, also looking like ones to watch out for in Carnac. This was the first time we’ve raced at the French Open Skiff event and having loved every minute of the long weekend we will certainly wish to be back again next year. We hugely appreciated the warm, friendly welcome and the competitive but fun racing with this close-knit group of skiff sailors who make the pilgrimage to Lac du Der each Easter. The next RS800 Eurocup event is the 2018 European Championships in Carnac, Brittany from 26-29th May. It will be great to see nearly half the teams from the French Open Skiff back together again then to be joined by lots more teams from the UK and the rest of Europe. The Eurocup series will continue at the RS Games (including the UK Nationals) at Weymouth in August and moves to the Netherlands for the final event in September. 13 1101 RS800 FRA EMANUEL ALEXANDRE PERNET FRANCK YC Grenoble Chara.